IT’S KID’S NIGHT WITH THE COST CUTTERS BIG BICYCLE BLOWOUT! 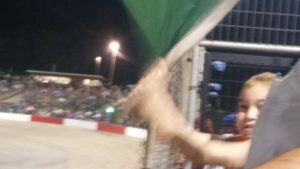 ITS NO HOLDS BARRED/HEART POUNDING/SIDE BY SIDE RACING ACTION SEE MORE CARS MORE STARS SEE SEVEN DIVISIONS RACE INCLUDING THE COST CUTTERS LATE MODEL 50 . THE CHASE FOR THE CHAMPIONSHIP CONTINUES! ATTENTION KIDS….IT’S YOUR NIGHT! STOCK CAR RIDES AT SIX, BIG WHEEL RACES AND THE GREAT BICYCLE GIVEAWAY. RACING SATURDAY AT 7. COST CUTTERS HAS YOUR FREE TICKET TO THE RACES INCLUDED WITH A HAIRCUT THIS WEEK AT PARTICIPATING COST CUTTERS FAMILY HAIR SALONS. YOU ARE WELCOME TO DONATE A NEW ASSEMBLED BICYCLE FOR THE KIDS. ALL SIZES, BOYS OR GIRLS BICYCLES ARE APPRECIATED.